His offensive spike began earnestly in March, when he was playing primarily on his off-side. Seizing the opportunity with points in 14 of 17 games between March 1 and April 3, his high level of play continued into the postseason, where he absorbed an extra minute of ice time due both to his own performance and the injuries to fellow left-shooting defensemen in Willie Mitchell and Robyn Regehr. He logged 28:13 in a terrific performance against Anaheim in Game 1 as he scored a power play goal, accentuated the team’s rush and sharp puck movement, and blocked four shots – one on Corey Perry’s pristine attempt earlier in overtime. Only 18 five-on-five goals were scored with Martinez on the ice, 12 fewer goals than any defenseman other than Andrew Campbell and one more than the 17 goals against he was on the ice for in the playoffs. That’s a number that likely has its roots in a very high .939 five-on-five save percentage while he was on the ice, and that he more than any other defenseman was inclined to start shifts in the offensive zone and against weaker competition. 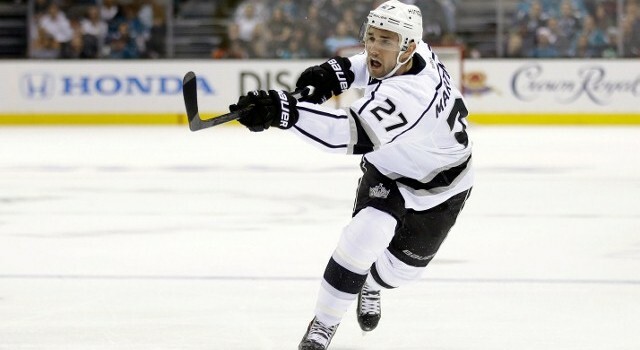 But the defensive aspects of Martinez’s game – Darryl Sutter critiqued Martinez’s ability to play the puck while skating backwards in January – appeared to be grouped together with greater consistency as the season progressed and he continued to take advantage of the minutes available. Dating back to February 11, 2013 and including playoff games, the Kings are 70-32-9 with Martinez in the lineup and 25-26-2 with Martinez out of the lineup. The bad: Not a ton, other than the relative whole-game balance that 25-year-old puck-moving defensemen with fewer than 200 regular season games played are searching for. That’s not to say that this was any type of a glaring issue in the playoffs, and Martinez, who has now played 203 NHL games, also has 59 playoff games under his name as well as a pair of Stanley Cups. One of the team’s top possession players, Martinez produced weaker numbers than he had in the previous two seasons. He Corsi-for percentage relative to when he was not on the ice was in the red, and his 56.3% five-on-five Corsi-for was lower than that from 2012-13 (59.6%) and 2011-12 (61.9%). Again, not that important. But there is some data that would seem to suggest that Martinez could be challenged in reaching some of the offensive marks he hit in 2013-14. His career-high 11 goals came on a 13.9% shooting percentage, and that combined with Los Angeles’ .939 save percentage while he was on the ice helped produce a 102.5 PDO, the third-highest rate on the team (What is PDO?). Martinez hasn’t taken a ton of shots in his career – his 1.32 shots on goal per game is lower than Voynov’s (1.67), Doughty’s (1.96) and Muzzin’s (1.97) – and registered only 79 in 2013-14. If he’s going to score 11 goals again, he should look towards cracking triple digits in shots for the first time in his career. He got off to a slow start, logging only one assist over the team’s first 29 games, and suffered an elbow hyperextension in the Dodger Stadium game that kept him out through the Olympic break. Going forward: “He’s a young guy, and hopefully he’s growing in to understanding what it takes to be a consistent defenseman on a good team,” Sutter said in March, and while Martinez is still in the “teen-minute” range, he certainly made the absolute most of the opportunity presented and rounded out many of the edges in his “whole game,” as Sutter referenced above. An unrestricted free agent after the upcoming season, Martinez is obviously a proven piece in a championship puzzle and is a young, left-shooting defenseman who continues to develop on a team that has openings for left-shooting defenseman and has been addressing its defensive depth. 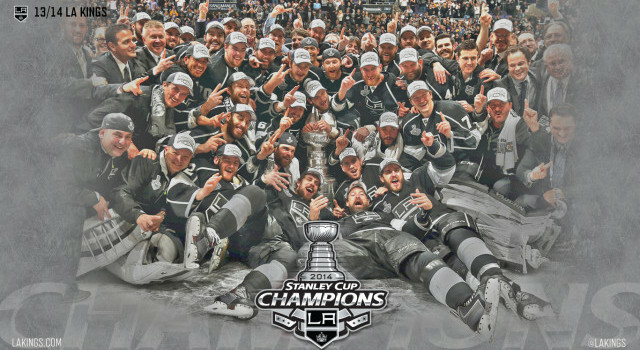 It gets tricky, though, because the team will also be dealing with three players whose contracts expire on July 1 and would become unrestricted free agents in Justin Williams, Jarret Stoll and Robyn Regehr, and six restricted free agents in Kyle Clifford, Tanner Pearson, Jake Muzzin, Andy Andreoff, Tyler Toffoli and Jordan Nolan. With 58.9 million dollars already allotted to current players for 2015-16, and Anze Kopitar eligible to negotiate a new contract on July 1, 2015, Dean Lombardi, Rob Blake and Jeff Solomon will have a lot on their plate over the next year. Martinez has played through intermittent usage and occasionally tough love from Darryl Sutter, and playing in a contract year shouldn’t distract the intelligent and aggressive puck-mover.